James Pritchard, A Bridge of Ships: Canadian Shipbuilding during the Second World War (Montreal and Kingston: McGill-Queen’s University Press, 2011), 438 pages. 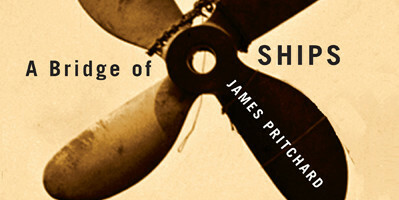 James Pritchard’s A Bridge of Ships comprehensively surveys the wartime effort of the Canadian shipbuilding industry. Using an impressive array of archival sources, Pritchard makes an important contribution to our understanding of the intersection between society, industry, government, and the military during the Second World War while building upon recent works in maritime and naval history. In the last twenty years, scholars have begun to examine shipbuilding industries, shipping, and naval logistics in Britain and to a lesser degree the United States. Pritchard extends this historiographic trend to Canada also while tying the shipbuilding industry to the story of Canada’s economy in the twentieth century. Unlike the wartime aircraft industry, the shipbuilding industry did not develop a lasting legacy that would survive into the Cold War era. Plimsoll markings on the bow of an almost completed ship to indicate cargo capacity, Pictou shipyard. Due to a dearth of new construction during the interwar period, those shipyards that did survive the period did so through repair work and building smaller ships for coastal work. 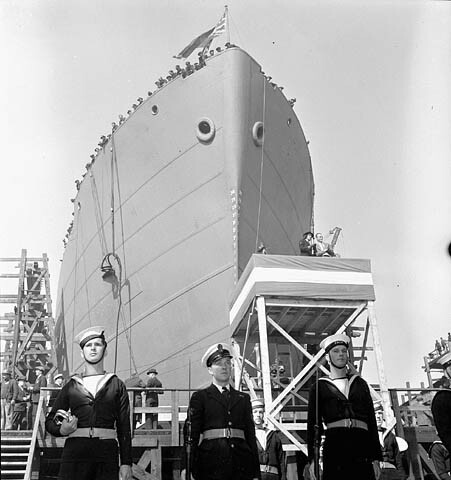 During the war, Canadian shipbuilding expanded dramatically to fill British orders. 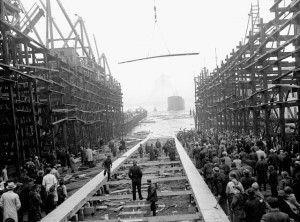 The personnel involved in shipbuilding expanded by an order of ten during the war. The Canadian shipbuilding effort fell into four categories: warship construction, cargo ship construction, repair work, and small boat construction. The cargo program was the largest, followed by the naval program, repair work, and the small boat program. The warship program was dominated by antisubmarine escorts for use by the Royal Canadian Navy (RCN) while the cargo program built large numbers of emergency vessels designed for wartime, not peacetime use. Pritchard highlights the provisional nature of the industry, even during its wartime expansion, by demonstrating that government officials viewed ships as munitions to be fired at the enemy and were not focused on the creation of a viable postwar industry. 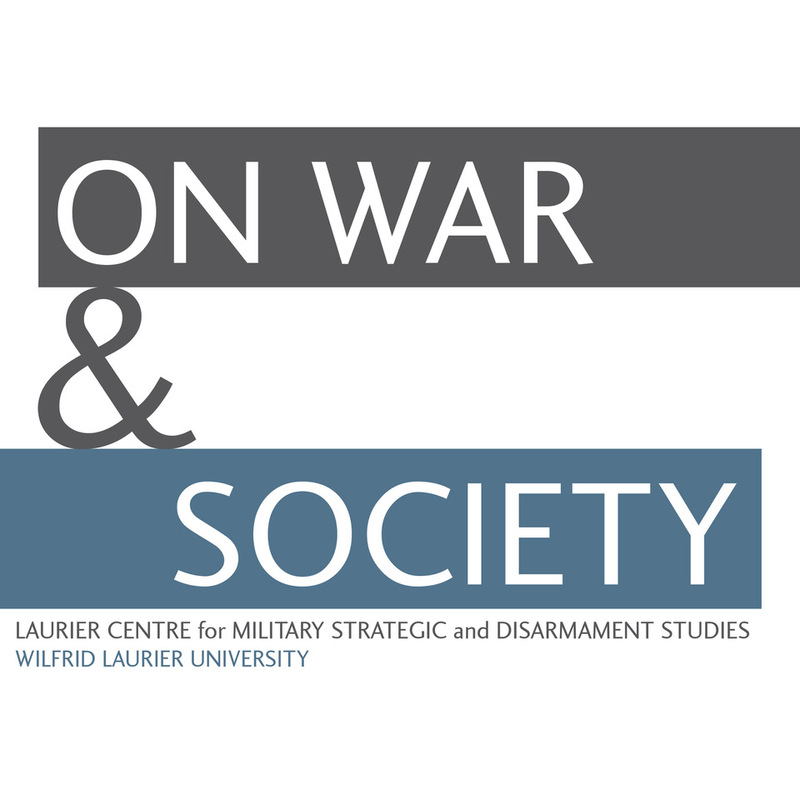 Organizationally, the RCN and the government were unprepared for the rapid wartime expansion. Additionally, shipyards lacked sufficient numbers of technical staff and naval architects, with the exception of the west coast where shipyard executives tended to have greater experience in shipbuilding over their east coast counterparts. The combination of these factors led to the shipbuilding program being placed under a variety departments and leaders during the first three years of the war. At the same time, government financial assistance allowed shipyards and secondary industries to expand their facilities. New warship construction occurred primarily along the St. Lawrence River while west coast yards focused on cargo construction. Two outstanding chapters examine the role of labor in wartime shipbuilding. Labor shortages affected the entire industry, especially the repair program that relied heavily on skilled workers. Many Canadians entered the industry in search of higher wages, though some were disappointed by higher taxes and government mandated savings requirements. Rushed training in welding, riveting, and other shipbuilding trades brought about a rise in industrial accidents, especially in comparison with American shipyards. Pritchard emphasizes the shortcomings in government policy regarding labor and industrial relations, which he attributes in part to the influence of the business-oriented Canadian Manufacturers Association. At the same time, Canadian shipyard unions frequently battled one another for members, inhibiting their political influence. 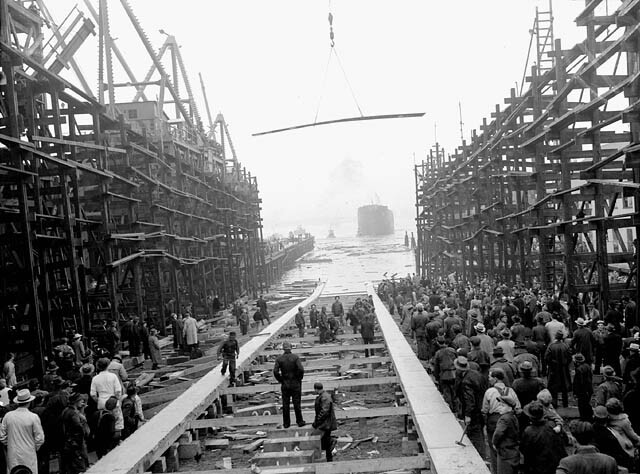 A crane lowers a plank to construct a new keel in the ways immediately after the successful launch of a ship. Shortages of steel and equipment from secondary industries created bottlenecks for new construction during the first several years of the war. In the summer of 1940, the government began working with steel mills to increase steel production, but these efforts were initially insufficient. Large imports of steel from the United States filled the gap until 1943 when reliance on steel imports began to decline due to rapid increases in Canadian steel production. Pritchard highlights the role of entrepreneurship in expanding production in secondary industries that produced marine engines, deck equipment, forgings, fittings, electrical wire, ordnance, and weapons. Small boat production relied heavily on small and medium-sized firms which built almost ten thousand motor launches, minesweepers, auxiliaries, tugs, landing craft, and utility boats for the Royal Canadian Air Force. Throughout the war, the naval program remained small in comparison with the cargo program, though the industry successfully acquired the physical capacity and technical skill to build modern warships such as the Tribal-class destroyers. 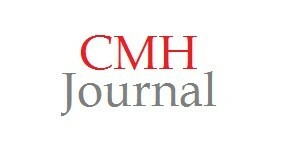 The cost of production in Canada remained stubbornly high compared to the United States and the United Kingdom. Within Canada, construction in west coast shipyards was thirteen percent more expensive than in eastern yards due to economic differences between the regions. 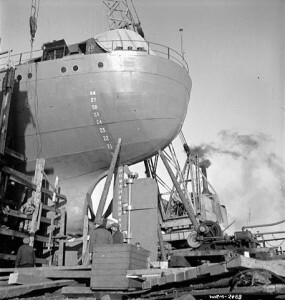 View of the christening podium and guests of honour at the launch ceremony of the 10,000 ton cargo ship, the S.S. For Esperance, from the United Shipyards Ltd.
Pritchard concludes by noting success and failures of the industry. The industry did contribute significantly to Allied shipbuilding, especially in cargo ships, and repair work performed in Canada allowed returned thousands of ships to service. Asked to perform prodigious feats of production, Canadian shipbuilding met the challenge. At the same time, the industry and the Navy failed to develop engineering significant design capabilities, forcing the postwar RCN to continue to rely heavily on Britain and the United States for experienced naval architects. In addition, a limited machine-tool industry as well as a lack of political support meant that, unlike the aerospace industry, Canadian shipbuilding only survived the Cold War through large-scale government support. A Bridge of Ships will remain the standard work on the Canadian shipbuilding industry during the Second World War. Pritchard comprehensively examines the role of government, shipyard facilities, business leaders, unions, workers, and the Navy in contributing to the success of the shipbuilding program. He has combed an impressive collection of archives on both coasts: the Esquimalt Municipal Archives, the Marine Museum of the Great Lakes at Kingston, and the British Columbia Archives and Records Service to name a few in addition to Library and Archives of Canada and the American and British national archives. While organizational challenges, labor and steel shortages, and initially inadequate facilities hampered the program, the shipbuilding program made substantial contributions to the Allied war effort. Pritchard’s work successfully illustrates the interaction between the military, industry, labor, and government to meet the shipbuilding challenges of the Second World War. Representative works include: Lewis Johnman and Hugh Murphy, British Shipbuilding and the State Since 1918: A Political Economy of Decline (Exeter, UK: University of Exeter Press, 2002); Jeffrey Dorwart, The Philadelphia Navy Yard: From the Birth of the U.S. Navy to the Nuclear Age (Philadelphia, PA: University of Pennsylvania Press, 2001); Michael Lindberg and Daniel Todd, Anglo-American Shipbuilding in World War II: A Geographical Perspective (Westport, CN: Praeger, 2004); Thomas Heinrich, “Jack of All Trades: Cramp Shipbuilding, Mixed Production, and the Limits of Flexible Specialization in American Warship Construction, 1940-1945,” Enterprise & Society 11, no. 2 (June 2010): 275–315; Kevin Smith, Conflict Over Convoys: Anglo-American Logistics Diplomacy in the Second World War (New York: Cambridge University Press, 1996).